Santorini embraces all that has made the Greek Islands legendary -- splendid beaches, unparalleled architecture, dramatic cliffs and quaint villages. Ride a donkey up the trail to the city of Thira or take a cable car. 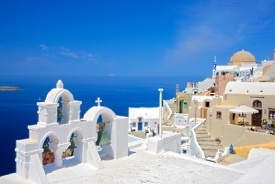 The views from Thira, set atop a ledge overlooking the sea, are stirring. Most ships allow just enough time here to wander the streets, admire the churches and browse the shops and cafes.